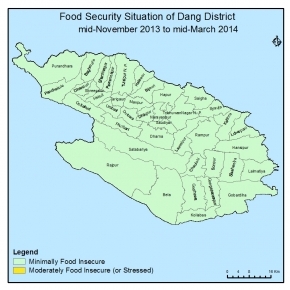 All the VDCs/Municipalities (41 VDCs/Municipalities) of the district is minimally food insecure during this monitoring cycle (mid July to mid November, 2013). The crop of paddy and maize across the district have been harvested and normal production, which has supported to up to 60% of household to food stock for more than 4 month.The production of other agricultural product (green vegetables, potatos, fish, honey) was normal. About10,02,00,000(10 karor 2 lakh) NPR was earned from sale of agricultural product and 20361 HH were involved on that process. Likewise 66608 HH were on the involved of livestock and livestock product (meat, milk, egg, ghee etc.) and total income was NPR 1,25,39,76,950 (1 Arab 25 karor 39 lakh) during July - Nov. Similarly the HH of 28200 have been earned NPR 54,00,00,000 (54 karor) from the remittance, 445 hh NPR 25,60,000 earned by NTFP and 61200 hhs earned NPR 1,22,40,00,000 from the wage in this period. Local level markets are functional with sufficient food stock to fulfill the public dimand.Wage opportunity from farm activities and construction work (public, private & factories ) is created during the period which is normal like previous year. No natural disasters; no epidemic; tradional coping mechanism; generally peaceful situation was observed during this monitoring cycle. Food security situation will remain same because up to 60% hhs food stock will be sufficient for more than 6 months, due to remmittance flow seems to be same as before, wage opportunities in key markets and factories, market also will be well functioning . Cash crops and NTFP (honey, vegetable & livestock product) will be selling continue. The civil security situation will likely to be remain same.